Wales’ Bradley Davies celebrates after the match. 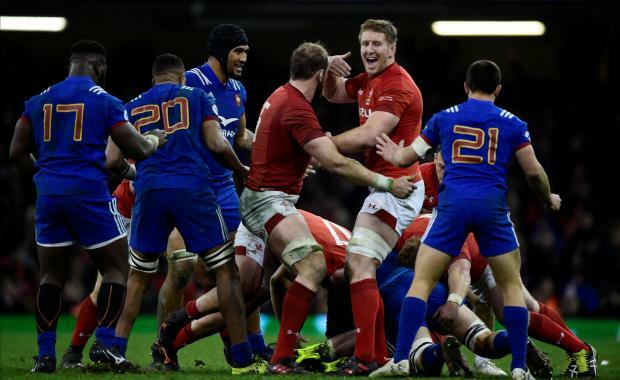 Wales made the most of limited possession to beat France 14-13 in the final game of the Six Nations at the Principality stadium on Saturday. Wales prevailed thanks to a try by Liam Williams and three penalties by Leigh Halfpenny to end the championship in second place behind Ireland who sealed the grand slam by beating England 24-15 at Twickenham. France, who have been showing signs of improvement since they beat England last Saturday, scored a try through Gael Fickou with Francois Trinh-Duc kicking a drop goal and Maxime Machenaud slotting home a conversion and a penalty. Les Bleus had the upper hand, notably in the second half, but finished the tournament in fourth place in new coach Jacques Brunel's first campaign in charge.